Regional destination management company Luxe Asia recently teamed up with Bakamuna to design a contemporary workspace for their premises located at Vauxhall Street, Colombo-2. Bakamuna, a venture powered by MTI Consulting, is led by Bakamuna CEO and Chief Rochelle Bibile who uses mixed media to create original concepts and illustrations. Their designs are inspired by nature, culture, elements of music and movement to name a few. As Luxe Asia specialises in showcasing the best Sri Lanka has to offer to its many foreign visitors, Bakamuna decided that the interior of the office should reflect aspects of the country which makes it a unique destination to visit. 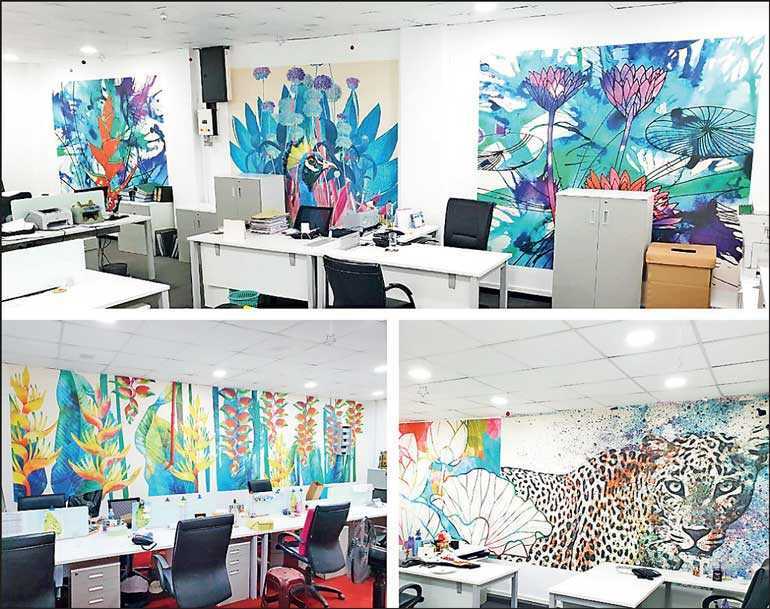 A mix of wildlife and nature- based themes such as the Sri Lankan leopard, peacocks and elephants along with lotuses and other tropical plants were selected to be displayed as large-scale art around the Luxe Asia office. Bakamuna Chief and lead designer Bibile used various techniques and materials such as watercolours, ink, cultural motifs and extracts of Sinhalese passages to bring the wonders of Sri Lanka into a contemporary setting suited for a modern workspace. Since 2009, Luxe Asia has been creating itineraries that suit the needs of travellers to enable them to enjoy the splendours of the Pearl of the Indian Ocean. “The display of Sri Lankan wildlife and plant-based designs by Bakamuna around our office adds value to the purpose of our company which is to help travellers discover or rediscover the best our country has to offer” stated by Luxe Asia Managing Director Chaminda Dias. Bakamuna is a mixed media lifestyle design brand that aims to create original design concepts and mixed media illustrations, connect with individuals and facilitate idea expression and collaborate with businesses to bring value through design. They actively support the local art community and encourage diverse forms of creative expression.